at Chiragh Grammar School, in Meerut, India. 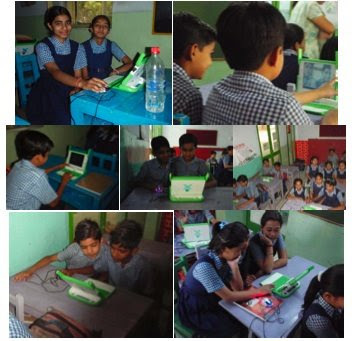 I was experimenting with the role of the low cost, rugged, OLPC laptop computers in science classrooms. So how did it go? Well I just so happened to write it all up! Although I wrote up this full report (20 pages) in early May, we weren't sure where the report should go. If you're interested in reading it all, find it over at Iridescent Inc -- the non-profit science education group I've been involved with the past few years in Los Angeles. Click here for Iridescent's Educator website. Since I wasn't sure the audience that I was writing this for, nor where the report would show up, I didn't put a whole lot of effort into polishing it (grammatically or otherwise). That said, I put in our experiences and hope that others can benefit from what we learned! I have proposed writing a physics textbook for the XO. Write to me at echerlin@gmail.com if you are willing for us to use your materials. 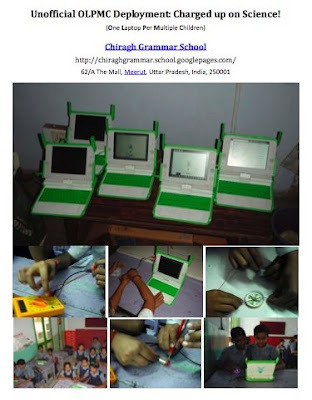 Would love to have a synopsis for OLPC News. Something short to let people know you wrote this and how other OLPC implementers can use it.